Farrar, Straus and Giroux, 9780865477568, 416pp. For most Americans, candy is an uneasy pleasure, eaten with side helpings of guilt and worry. Yet candy accounts for only 6 percent of the added sugar in the American diet. And at least it's honest about what it is—a processed food, eaten for pleasure, with no particular nutritional benefit. So why is candy considered especially harmful, when it's not so different from the other processed foods, from sports bars to fruit snacks, that line supermarket shelves? How did our definitions of food and candy come to be so muddled? And how did candy come to be the scapegoat for our fears about the dangers of food? 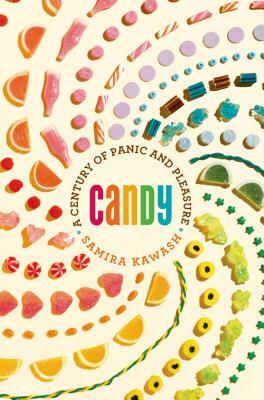 In Candy: A Century of Panic and Pleasure, Samira Kawash tells the fascinating story of how candy evolved from a luxury good to a cheap, everyday snack. After candy making was revolutionized in the early decades of mass production, it was celebrated as a new kind of food for energy and enjoyment. Riding the rise in snacking and exploiting early nutritional science, candy was the first of the panoply of "junk foods" that would take over the American diet in the decades after the Second World War—convenient and pleasurable, for eating anytime or all the time. And yet, food reformers and moral crusaders have always attacked candy, blaming it for poisoning, alcoholism, sexual depravity and fatal disease. These charges have been disproven and forgotten, but the mistrust of candy they produced has never diminished. The anxiety and confusion that most Americans have about their diets today is a legacy of the tumultuous story of candy, the most loved and loathed of processed foods. Candy is an essential, addictive read for anyone who loves lively cultural history, who cares about food, and who wouldn't mind feeling a bit better about eating a few jelly beans. Samira Kawash has a Ph.D. in literary studies from Duke University and is a professor emerita at Rutgers University. She is the author of Dislocating the Color Line and the founder of the website Candyprofessor.com. Kawash lives in Brooklyn.